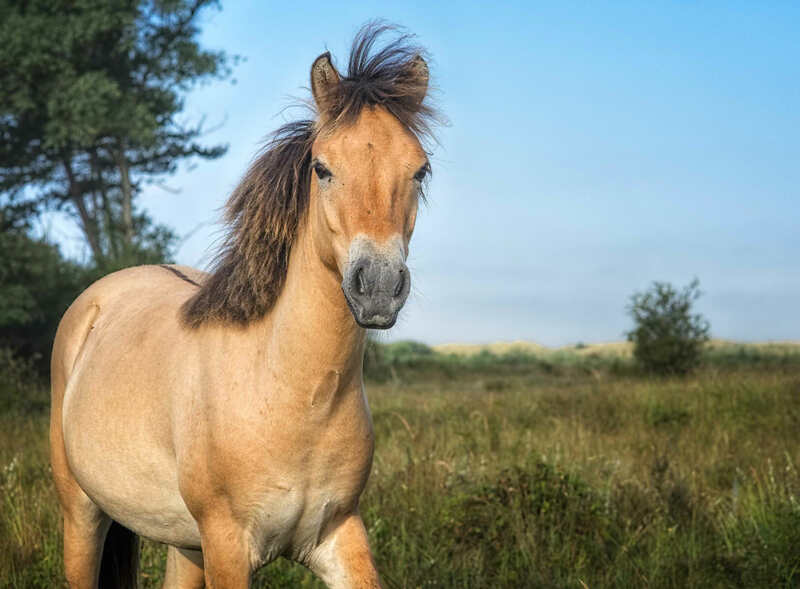 Exmoor pony yearling having its portrait taken near Castricum, NL. This morning the cat woke me up later than usual to let me take a trip into the dunes. Thank God I did remember not to hurry. It was already going to be a beautiful summer day and I rode my bike to the dunes quite leisurely, enjoying the flowers in passing. When I arrived at my usual stomping ground I saw a horse on a dune silhouetted against the morning sky. There appeared to be a whole herd of them. First I shot with a longer lens. Then I got down on one knee in the lush grass and started shooting with my favorite portrait lens. The horses gradually started to come closer and closer until they were sometimes only 6 feet away, quite trusting and more curious than scared. We seemed to have a natural understanding. It was like having set up a mobile portrait studio in the field: they got their portrait taken one by one. I spent a whole hour getting a ton of horse pictures before leaving them to their further roamings, grateful for having been allowed some time in their soothing presence.